In this post I will be continuing my series on the omega current. The omega current is a leak current that passes through the voltage-sensor domain (VSD) of mutated voltage-gated cation channels. Mutation of the VSD S4 helix can reveal a cryptic pore that allows ions (H+, Li+, K+, Rb+ and even guanidinium) to cross the membrane. In my previous post (The Omega Current), I discussed the most well characterized omega pore of the Shaker Kv channel VSD. This pore is generated by mutation of the first S4 helix arginine to an amino acid residue with a small side chain (cysteine, serine, alanine, etc.) (Tombola et al., 2005). In this post, I will be discussing naturally occurring mutations of voltage-gated Na+ (Nav) channels and voltage-gated K+ channels (Kv) that result in omega current leak and cause human congenital diseases, known as channelopathies. Examining these naturally occurring mutations can give us further insight into what the omega pore can teach us about the mechanism of voltage-gating in cation channels. To begin this second post of my series on the omega current, I would briefly like to discuss why we should be interested at all in omega currents. Voltage-gated cation channels underly the fast signaling of our neurons and contraction of our muscles. They create the action potentials that carry signals throughout the body and the brain. By studying the behavior of mutant channels it may be possible to gain insight into the mechanism of how these channels measure and respond to the membrane voltage. Although we have know about the existence of channels that open and close with respect to changes in the membrane voltage for a long time, the mechanism of how these channels work are only now being elucidated. Indeed, we still have a lot to learn. As I discussed in my previous post, the discovery of omega current and omega pore, conducting ions through the VSDs themselves, led to an interesting hypothesis as to how this voltage-sensing might occur: the “gating pore” model. In addition, the discovery of the omega current mutations allowed scientists who study channelopathies to hypothesize an omega current based mechanism behind why certain VSD mutations caused disease. These hypotheses were then experimentally verified (Solokov et al., 2007). This is significant since, although there are many FDA-approved life-saving medicines that have unknown mechanism of action, the most important step toward developing a new treatment for a disease is the development of a complete physiological understanding of the disease. The discovery that ionic current could be carried through the VSD itself is also significant when considering the mechanism of the voltage-gate H+ (Hv) channels. As I have discussed in an introductory post (Human Hv1: Architectural Overview), Hv channels are comprised only of a dimer of VSDs without the associated pore domain seen in the other voltage-gated cation channels (Sasaki et al., 2006; Ramsey et al., 2006). This has led to the hypothesis that the Hv channel VSD itself harbors a state-dependent H+ conduction pathway. Indeed, there is a growing body of evidence to support this idea (Tombola et al., 2008; Tombola et al., 2010; González et al., 2010; Musset et al., 2010). Clearly, the omega current observed in the mutant VSDs of other voltage-gated cation channels and the native conduction of H+ through Hv channels might have some mechanistic connection. In future posts, I will discuss proton conduction through mutated Kv channel VSDs as well as what we think we know about conduction through the Hv channel. However, I have found that understanding what we know about the omega current is central to any discussion about Hv channel conduction. The most well characterized omega current causing mutations associated with channelopathies occur in Nav channels (Solokov et al., 2007; Mathews et al., 2009). So before discussing the diseases themselves and the mutations that cause them, I would like to introduce the structural architecture of these channels. Unlike Kv channels, which are comprised of a four-fold symmetric multimer of identical subunits, eukaryotic Nav channels are comprised of a single polypeptide with four non-identicle domains (Fig.1). Each of these domains has a Kv-subunit-like six transmembrane (6TM) helix topology (Fig.1). These four domains assemble around the pore comprised of the S5 and S6 helices of each domain (IS5, IS6, IIS5, IIS6, IIIS5, IIIS6, IVS5 and IVS6) to generate a Kv-channel-like structure with the VSDs on the periphery surrounding the pore. Clearly, Nav channels are not four fold symmetric. The expression of the entire channel as a single polypeptide has allowed evolution to alter each domain individually while ensuring that the different VSDs still associate with the same Na+ selective pore. The divergence of the different domains has even resulted in the four VSDs having different numbers of S4 arginine residues (Fig.1, Table 1). Figure 1. Nav channel topology. VSD transmembrane helices are shown in orange whereas the helices that form the pore are brown. The helices are labeled above using the domain number and the S1 through S6 classification of 6TM-domains. The membrane is indicated by the parallel black lines with the cytoplasm toward the bottom. The ‘+’ symbols on the S4 helices indicate the number of positively charged residues found on Nav1 channels (see Table 1). 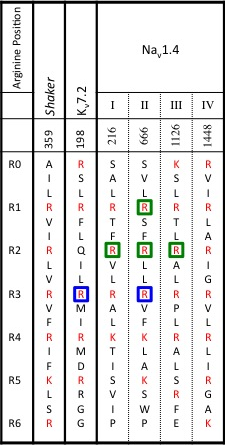 Please note that the “alignment” of the Nav1.4 channel S4 helix sequences in Table 1 (with each other and with the Kv sequences shown) is not intended as a definitive alignment. As I have stated previously, (in my post The Problem of Aligning S4) it is very difficult to generate a satisfying alignment for S4 helix sequences. Many possible alignments exist and I have simply selected one. In fact, Table 1 is adapted for my purposes from a much more detailed table that shows all known disease causing S4 mutations in Jurkat-Rott et al., 2012. The Shaker Kv arginine positions are shown only as a reference. Thus far the only Nav channel structures that have been solved are of prokaryotic channels that are four-fold tetramers of a single 6TM-domain (Payandeh et al., 2011; Payandeh et al., 2012; Zhang et al., 2012). Each domain of these prokaryotic Nav channels have identical sequences and hence they lack the greater complexity of the eukaryotic Nav channels. Now, I will go on to discuss the naturally occurring disease causing mutations that are known to generate omega current. Three very good review papers on omega-current-leak-related channelopathies have been written and were very helpful when writing this post, I highly recommend them fro anyone who would like to learn more: Cannon, 2010; Catterall, 2010 and Jurkat-Rott et al., 2012. Hypokalemic periodic paralysis (HypoPP, read more about it on wikipedia here) is a debilitating illness that results in weakness and paralysis when levels of K+ in the blood decrease. Of the 15 mutations discovered in Nav and Cav channels that result in HypoPP, 14 occur at S4 arginines of the VSDs (Mathews et al., 2009). Although not all of these mutations have been functionally characterized several have been shown in Nav1.4 channels to result in omega current leak: R222G (Jurkat-Rott et al., 2012), R669H (Solokov et al., 2007; Wu et al., 2011), R672G/H (Solokov et al., 2007; Solokov et al., 2010), R675G/Q/W (Solokov et al., 2008) and R1132Q (Francis et al., 2011) (Table 1). The majority of these mutations, similar to the mutations discussed in my previous post, replace the large arginine side chain with a smaller amino acid side chain (for example G, S, C, H or Q). Interestingly, in one case, the mutation of R669W, the arginine is replaced by a large bulky tryptophan side chain. Nonetheless, this mutation still results in omega current leak (Solokov et al., 2008). I will discuss the interesting ramifications of this tryptophan mutation more below. Another important difference between the omega current leak from these mutant Nav1.4 channels and those from the mutated Shaker Kv channel discussed in my previous post, is that the omega current generated from the mutations of Nav1.4 channels occur at physiological membrane potentials. To observe omega current leak through the VSD of the Shaker Kv channel R1S mutation it was necessary to hyperpolarize the membrane to >-100 mV. However, many of the Nav1.4 channel mutants leak ions at membrane potentials of around -50 mV. Clearly, compared to the omega current leak generated from the Shaker Kv channel R1S mutation, the naturally occurring Nav1.4 channel mutants generate a more physiologically relevant leak that can easily contributes to the pathology of these mutants. The probable mechanism of how the small omega current leak leads to HypoPP has been nicely described in Cannon, 2010 and Jurkat-Rott et al., 2012. Essentially, leak from the omega pore in conjunction with the other conductances of the membrane result in a significant depolarization of the cell when the external K+ concentration drops (potentially 30 mV or more). This depolarization results in the inactivation of Nav channels, which in turn causes paralysis. Benign familial neonatal epilepsy (BFNE) is a rare genetic disease that causes newborns to have seizures (learn more about it on wikipedia here). BFNE develops within the first week after being born and then the seizures usually go away within the first 15 weeks of life. However, individuals born with BFNE have a much greater risk of having seizures later in life (Jurkat-Rott et al., 2012). Peripheral nerve hyperexcitability (PNH), also known as neuromyotonia (learn more about it here and on wikipedia here) is characterized by involuntary contractions of the skeletal muscles manifesting as muscle twitching and painful muscle cramps. Although there are a variety of causes from both BFNE and PNH, it has been shown that mutations in a single gene can result in both disorders (Dedek et al., 2001). The gene encodes for the Kv7.2 channel and the mutations, R207Q/W occur at an S4 arginine of the VSD (Dedek et al., 2001; Wuttke et al., 2007). Mutation of the homologous Kv7.4 at the equivalent position (R213Q/W) results in an omega current leak during depolarizations (Miceli et al., 2012). Although the disease causing mutations occur in the Kv7.2 channel, it is thought, due to the high homology between Kv7.4 and Kv7.2, that omega current leak is likely involved in the pathology (Jurkat-Rott et al., 2012). Therefore, the mechanism of pathology is thought to be similar to that described above and in more detail in Cannon, 2010 and Jurkat-Rott et al., 2012. Mutations of both the Nav1.4 channel and the Kv7.4 channel further down the S4 (arbitrarily shown aligned with the R3 position of shaker in Table 1) result in depolarization activated omega current. This indicates that the omega pore is only opened when the VSDs adopts the depolarized conformation (see my previous post The Omega Current for a cartoon schematic of the different VSD conformations). Depolarization activated omega current has also been seen in mutants of the Shaker Kv channel and I will discuss these mutations in more detail in a future post. The central question surrounding the formation of an omega pore through the VSD is whether the mutations reveal a cryptic-gating-charge pore through the VSD ( I will call this the cryptic pore hypothesis), or the mutations simply disrupt the native structure of the VSD resulting in ionic leak (I will call this the disruption hypothesis). These two theories of the omega pore lead to very different conclusions concerning our understanding of the mechanism of voltage-gating. As I discussed in my previous post the cryptic pore hypothesis leads to an interesting conjecture concerning the mechanism of gating charge movement through the VSD. However, if the disruption hypothesis is correct then we can’t make any significant mechanistic conclusions other than that the structure of the VSD is very sensitive to mutations and disruption of this structure can lead to formation of a pore that leaks ions. Examining the data from these naturally occurring mutations can give us insight into this question. The cryptic pore hypothesis was first postulated from the observation that mutations of the large arginine side chain to smaller side chains (G, S, C, H or Q) resulted in the formation of an omega pore capable of conducting guanidinium ions (Tombola et al., 2006). It was proposed that removal of the guanidinium-like side chain of arginine revealed a guanidinium biding site within the VSD. This binding site, located at a constriction point in the VSD, connected the cytoplasm and extracellular media. Therefore, when the VSD adopted the necessary conformation guanidinium ions could conduct through. This hypothesis seems plausible, however, it must be thrown into question by the discovery of the omega pore causing R675W and R213W mutations in Nav1.4 and Kv7.4 respectively. Tryptophan has a large and bulky side chain. It is hard to imagine how a mutation of arginine to tryptophan would result in a gap in the VSD structure that would reveal a guanidinium binding site. On the other hand, mutation to tryptophan has been used extensively to probe the structures of membrane proteins because its bulkiness can disrupt internal packing (Sharp et al., 1995). This strongly suggests that mutations of S4 arginines to tryptophan generate an omega pore not by revealing a cryptic pore but by disrupting the internal structure of the VSD. Does this mean that all of the other mutations also disrupt the structure? Even the mutations to smaller side chains? And if so why? These tryptophan substitutions observed in the naturally occurring mutations do not completely disprove the cryptic pore hypothesis, however, it should definitely make us think twice about it. It is certainly possible that the cryptic pore hypothesis is correct in the case of substitutions with smaller side chain and the disruption hypothesis is correct in the case of substitution with tryptophan. However, a dual mutation-dependent cryptic pore/disruption hypothesis would be thrown into question if it was possible to show that the mutations to smaller side chains could also perturb the structure of the VSD. Therefore before accepting this hypothesis we have to ask: is it reasonable or even possible for arginine substitution with smaller side chains to significantly disrupt the VSD structure? And if so, how? In my next post I will be examining these questions. Bezzina, C. R., Rook, M. B., Groenewegen, W. A., Herfst, L. J., van der Wal, A. C., Lam, J., Jongsma, H. J., et al. (2003). Compound heterozygosity for mutations (W156X and R225W) in SCN5A associated with severe cardiac conduction disturbances and degenerative changes in the conduction system. Circulation research, 92(2), 159–168. Dedek, K., Kunath, B., Kananura, C., Reuner, U., Jentsch, T. J., & Steinlein, O. K. (2001). Myokymia and neonatal epilepsy caused by a mutation in the voltage sensor of the KCNQ2 K+ channel. Proceedings of the …. Gamal El-Din, T. M., Heldstab, H., Lehmann, C., & Greeff, N. G. (2010). Double gaps along Shaker S4 demonstrate omega currents at three different closed states. Channels (Austin, Tex. ), 4(2), 93–100. Miceli, F., Vargas, E., & Bezanilla, F. (2012). ScienceDirect.com – Biophysical Journal – Gating Currents from Kv7 Channels Carrying Neuronal Hyperexcitability Mutations in the Voltage-Sensing Domain. Biophysical Journal. Sharp, L. L., Zhou, J., & Blair, D. F. (1995). Features of MotA proton channel structure revealed by tryptophan-scanning mutagenesis. Proceedings of the National …. Interesting post – one of the questions which I find fascinating is the cation selectivity of the omega pores. The D112 site in the Hv1 which has been recently proposed to be important for proton selectivity when mutated to other residues lands up conducting anions in addition to cations. In most Kv/Nav channels the corresponding site is not D and yet when the omega pore current mutation is introduced, the current remains cation selective. Not sure how that is accomplished. Another point which I find relevant is the evidence that non-S4 sites (I241/I287) can also be mutated to His to generate proton-gradient driven proton currents through the omega pore (Campos et. al., 2007). While a distortion of the VSD crevices is still possible in this case it seems a bit uncanny (not sure what one would make of that…). Suggestions of the distortion of the VSD crevices induced by charge neutralizations – was also seen in MD simulations performed by Tarek’s group (not sure though whether this is an “argument” in support). As far as cryptic pore vs pore disruption hypotheses: I somehow think its the latter. EY Isacoff’s group at Berkley showed that reinstating the fourth charge in the S4 helix does not compromise proton conduction in these channels. This would almost suggest the S4 charges do not play a deterministic role in occluding the omega-pore in the proper VSDs of voltage gated ion channels – there are other important “interactions” which need to be maintained to allow ion conduction. One more point which I find interesting about the omega current is the voltage dependence of its activation kinetics. It is surprising that omega currents in the mutant Kv channels shows distinct voltage dependent kinetics (rather than just being a linear leak) at voltages even lower than ~-130mV where all charge is in the down position (foot of QV is at ~ -90mV). What is the origin of this voltage-dependence if not the S4 charges? And if it is the S4 charges why doesn’t the QV show any gating current in those voltage-ranges. This almost makes me wonder whether the origin of this voltage-dependence is due to the ion itself that is moving (much like the voltage-dependence in ClC channels arises due to the permeating ion). One more fascinating aspect is the temperature dependence of the conductance of the Hv channels. While for other channels this is much smaller (except TRP of course!) for Hv channels the conductance changes steeply with temperature – much more steeply than the temperature dependence of proton diffusion by a Grottus mechanism. Why and how does this happen? I’m not sure whether the temperature dependence of the omega currents have been measured, but if they are anywhere remotely as sensitive as the Hv, then it would have important impact on the physiological consequences of the genetic conditions where the VSDs become leaky (Sokolov et. al. diseases). Well there are lots of aspects which when viewed individually seem interesting but when one tries to put the pieces together – they just don’t fit (at least not as beautifully). But I guess that is both, the frustrating and fascinating aspect of science itself. Thanks for the comments! In fact your thoughts foreshadow many of the ideas I will be discussing in my future posts. I have a few ideas about the selectivity of the omega leak but will not elaborate here since I will be writing more about it in the future. Also I will be discussing the proton conduction studies in the future too. I think I know which paper you are referring to but could you please provide a reference, I would like to read more about it. On another note, I like your posting image! Thanks again for sharing your thoughts. I will try to address them in future posts. So keep coming back to let me know how I do. “The Pore of the Voltage-Gated Proton Channel”, Neuron, 2011. Thomas K. Berger and Ehud Y. Isacoff, 72(6), 991. Thanks for the complement about the image!